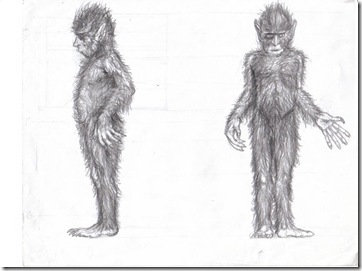 We are all familiar with the legends behind the Yeti, Loch Ness Monster, or Bigfoot, also known as Sasquatch. But some crytpids, (“a creature that may or may not exist”), aren’t so well known. Here are ten of those, from all across the world, to continue our Halloween-themed lists. The Devil Bird is known as the Ulama in Sri Lanka, where locals believe it exists. The bird is said to be an evil spirit that lives in the forests across the country. When its distinctive screech is heard, a death will soon occur, with there being no way of preventing the death. 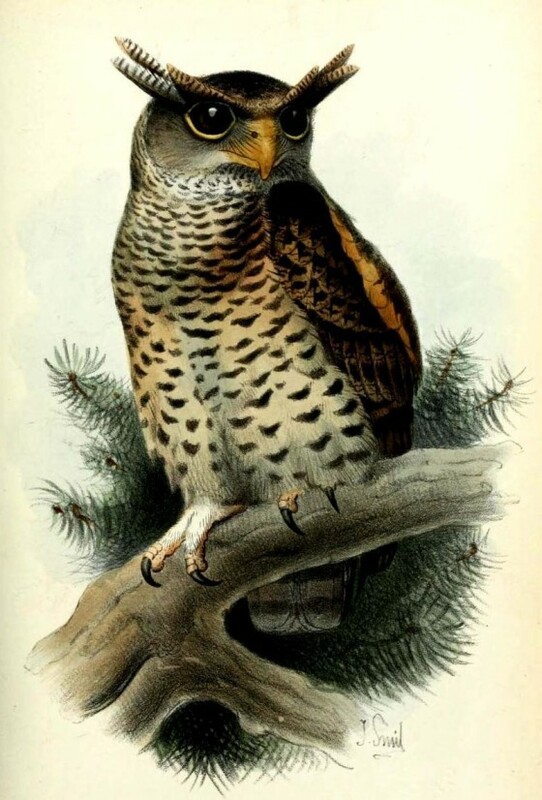 The real-life bird that makes this screech is still unknown, but it is widely believed to be the Spot-bellied Eagle-owl. The bird’s eerie cry sounds ominous, which may have started the legend of the devil bird originally. Giant animals are a popular theme for cryptids, and this legend is ancient. 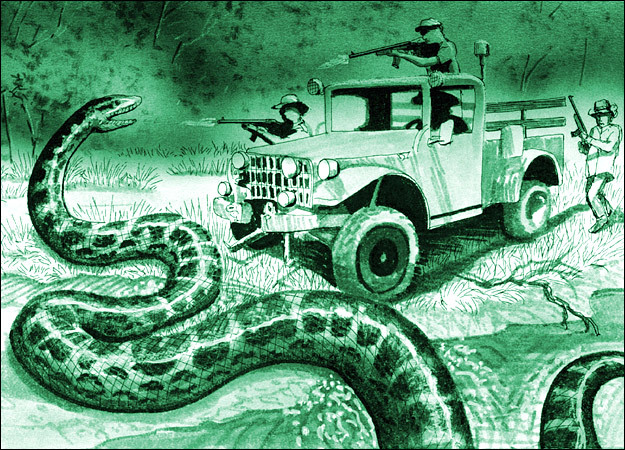 Since South America was first discovered, about 15,000 years ago, there have been written accounts of giant snakes. The length of the largest anaconda ever recorded is controversial, but it’s about 25 to 33 feet (7 to 10 meters). However, that hasn’t stopped accounts being written of anacondas being over 150 feet (45 meters). The fossil of Titanoboa, the largest snake in history, was found in Colombia in 2009. The snake is believed to have measured 50 feet or more. Carnivorous man-eating trees are rumored to exist throughout the world, although most have been dismissed as hoaxes. In 1881, a German explorer Carl Liche wrote about a tribe in Madagascar who had a sacrificial ritual in which people were fed to a vicious tree. About 50 years later, Michigan Governor Chase Osborn wrote a book about the tree. It was later determined that everything about the tree and the tribe had been fabricated. 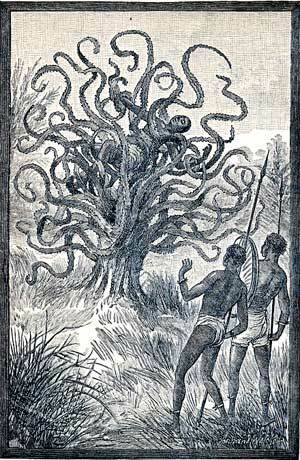 The Ya-te-veo is a man-eating tree that supposedly lives in Central America, with subspecies found in Africa. Its name means “I see you” in Spanish. The legends of the Sotho-Tswana tribe in southern Africa talk about the mamasianoke. 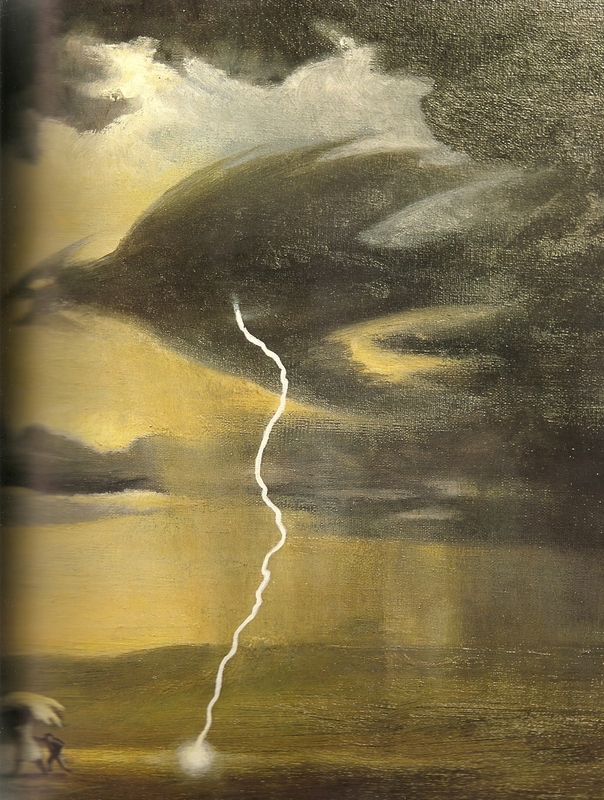 The creature, also known as the lightning bird, is a giant cloud-shaped spirit. It is a dark gray color, and will strike huts with lightning when it wants to make its nest there. It a hut is hit by lightning twice, the Sotho-Tswana will tear down the hut and move it to a different location. Locals also put two sticks on top of their huts, in order to prevent the lightning bird from making a nest on the roof. In the Caribbean, locals believe an octopus known as the lusca can grow up to 200 feet (60 meters) long. This is despite the fact that the largest octopus ever discovered was only 13 feet (4 meters), and the Earth’s largest known animal, the blue whale, is about half the size. 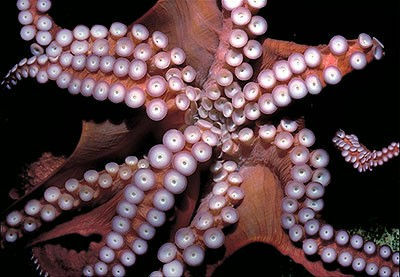 An octopus would have to balance one tentacle on the sea floor in order to attack properly on the surface, something extremely unlikely. However, the lusca has been referred to as an evil spirit, explaining its abilities, which also includes changing color, like several smaller octopus species. In the Gobi Desert, a worm exists that is bright red and about 5 feet (1.5 meters) in length. It can spew yellow acid, which will instantly burn anything it comes in contact with. As if that isn’t bad enough, it can shoot off enough energy to kill humans from a long distance away. 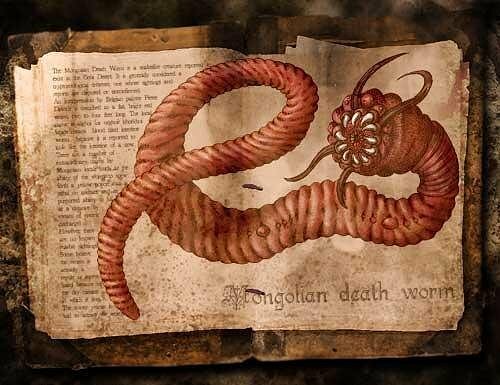 Locals swear it exists in the Gobi desert, and it has been given it the coolest name on this list, the Mongolian death worm. Mongolians refer to it as the “intestine worm”, because of its appearance. SyFy even produced a made-for-television movie named Mongolian Death Worm, based on the creature. In Michigan, Connecticut, and Ohio, monsters known as melon heads are said to roam the forests, occasionally attacking people. Ohio has the most interesting story, so we’ll focus on their melon heads. 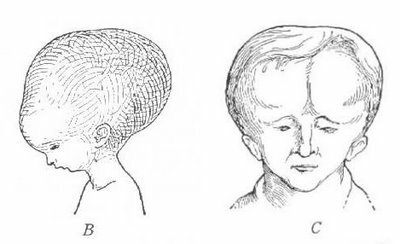 The story goes that there was a group of orphans under the watch of Dr. Crow, who performed brutal experiments on the children, causing them to develop large, hairless heads. One day, the children rose up and killed Dr. Crow, before burning the orphanage to the ground. They then hid in the forests, where they live to this day, waiting for a car to come along a lonely stretch of road late at night. The Hellhound is similar to the dragon in that it is found in folklore throughout the world. It is usually referred to as having dark fur, glowing red eyes, and super strength and speed. In European legends, seeing the dog or even hearing its howl usually results in imminent death. Another common theme is that if you look into the hounds’ eyes three times, you will instantly die. 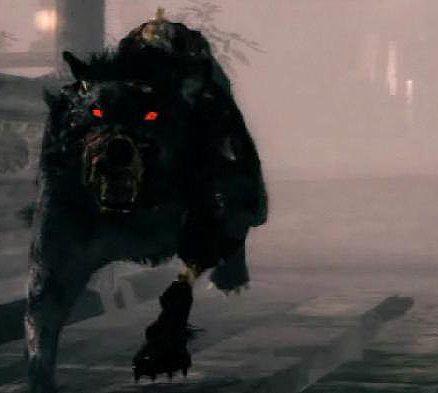 Hellhounds aren’t dogs at all, but rather demons from the afterlife. They are usually associated with fire, in cultures that link fire with Hell. 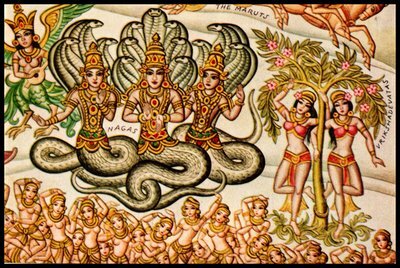 Nagas are half-serpent, half-human creatures believed existing in legends throughout Asia, particularly in Hinduism and Buddhism. Female nagas are known as nagis. The ancient Indian epic Mahabharata mentions Nagas throughout its story. They are shown as being wicked people who are punished by being turned into half-snakes. Sometimes they will show human traits, but on other occasions, they will show their snake-like characteristics. They are never pure evil, and sometimes Mahabharata depicts them as being on the side of good. They are frequently mentioned in the epic, and are one of the most important parts of Indian folklore and culture. In South Africa, the Bantu fear the Tokoloshe more than any other creature. Its name means dwarf, which is due to its small size. It looks similar to a monkey, with hair covering its entire body, and it has sharp teeth and hairy ears pressed against its head. An evil sorcerer can call up the tokoloshe to unleash misery and torment against someone they hate. The tokoloshe can turn invisible, and usually uses this ability to sneak poison into food or boiling water. The only way to catch a tokoloshe is to get help from a witchdoctor or herbalist, if they have the right enchanted medicine to deal with the creature. Locals believe wrapping bricks in newspaper and setting the bed on top while protect them at night, as tokoloshe is so curious that it will read the newspapers all night, and forget about attacking.